So, one thing you should know about me. I LOVE tequila. In margaritas, shot form, any kind, I am a fan. Often my husband’s and my date nights consist of sipping tequila and playing Scrabble while the baby snoozes. Having a baby did not change my fondness for tequila, perhaps my intake though. Nothing says hell like a tequila hangover and a 5:30am wake up call. I’ve been drinking the margaritas at KayNDave’s since before I got pregnant, I took a looooong 9 month break from those delicious things, and then came right back. KayNDave’s is the ultimate kid and adult friendly restaurant. Everyone brings kids there, but it doesn’t have an atmosphere of a “kid friendly” place. In fact, it screams hip and fun to me, no matter what time of day you go. They have a great outdoor patio in the heart of downtown Culver City (it’s heated too, so you can sit comfortably at night) and the inside is awesomely decorated. I bring all of our out of town guests there because it’s a place everyone would love. The food is AMAZE.BALLS. It’s upscale Mexican with a few random dishes thrown in, Avocado Bacon Burger anyone? 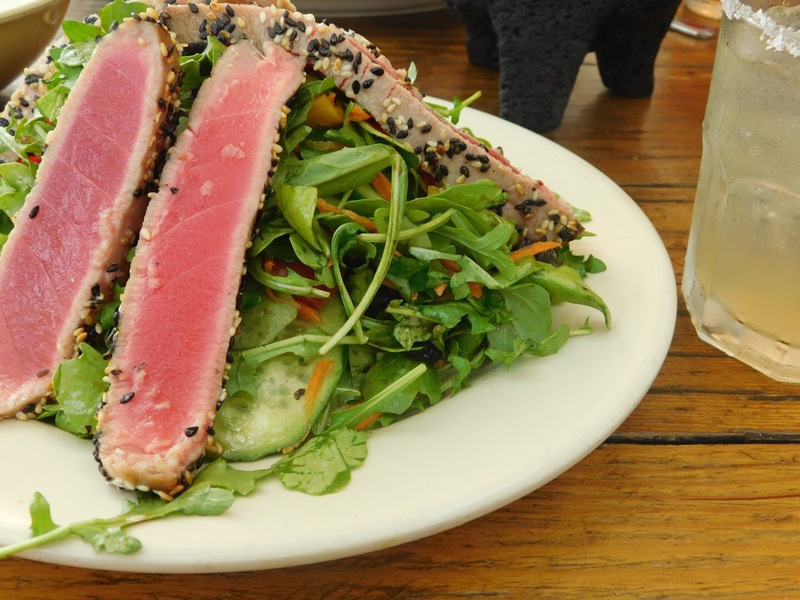 I always get the Seared Ahi and Arugula salad. Their brunch on the weekends is so good. Instead of chips and salsa, you get a basket of muffins and homemade jam-like, hi, yes I would like 10 blueberry muffins, thank you. But let’s talk booze. 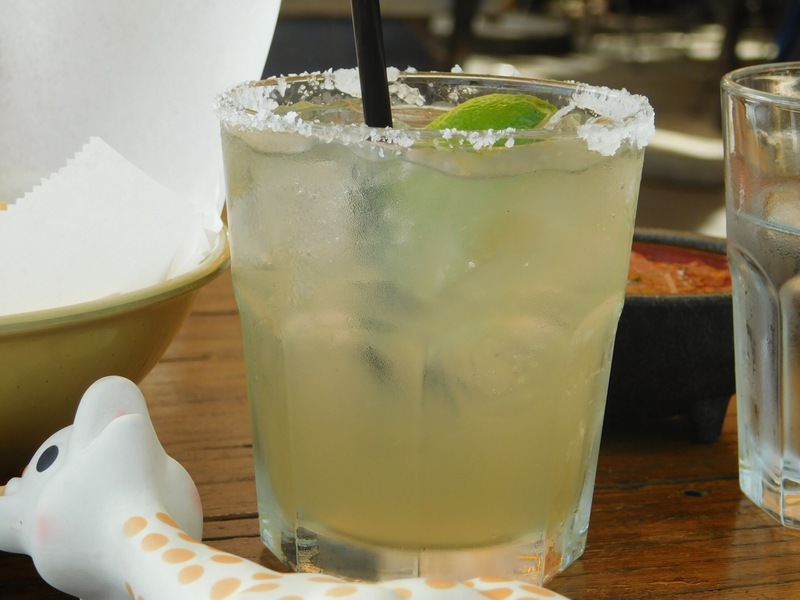 The house margarita is my go to, and on Monday’s it’s $3. The Skinny Cucumber Martini is awesome for those days you want to feel fancy and skinny. (Soooo, like everyday). They have a wide assortment of tequila and beer, and they usually have some sort of fun specialty shot. I tried the Dragonfruit infused tequila and it was dangerously yummy. The tables are spaced far enough apart so you aren’t sitting in your neighbors lap and if your baby throws guac it won’t hit anyone. Decent highchairs and kid friendly servers. The bathrooms would not be conducive to changing a diaper; no changing tables. The parking lot is small and depending on what time you go street parking can be limited. No area to wait for a table inside. Overall, KayNDave’s is definitely Boozy Mommy approved!